If you ask experts what the secret to a good marketing strategy is, it’s very likely that one of the answers would be to ensure that all of your product and service offerings are based on solid market research. Every time you come up with a new variant or a new line extension, and even as you craft your promotional and advertising strategies, you should ensure that all your actions are based on the right market research tools. Market research is important because you have to think of your consumers first and foremost as you craft your strategies. You need to know what works for them and what strategies they will respond to. This is where surveys come in. Conducting a survey can help you get to know your target consumers better, and this can subsequently help you come up with the right kind of marketing strategy. Here is the place where online survey sites like FluidSurveys step in. 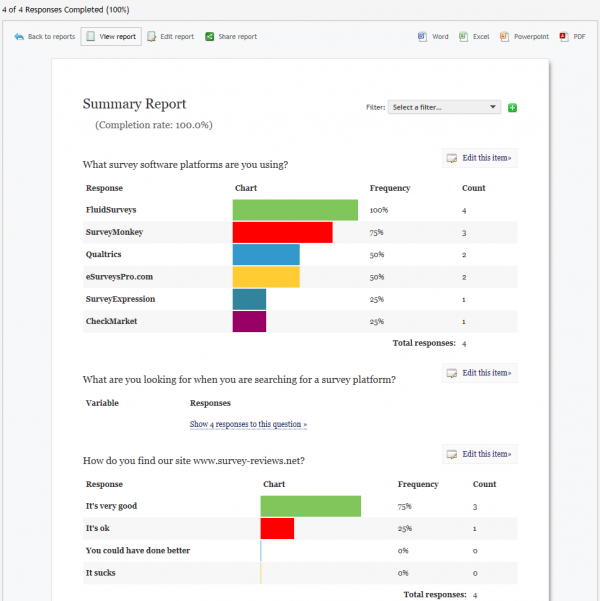 FluidSurveys is a do-it-yourself online survey tool that is meant to allow customers from around the world to create their own surveys, collect data from respondents, and analyze results. 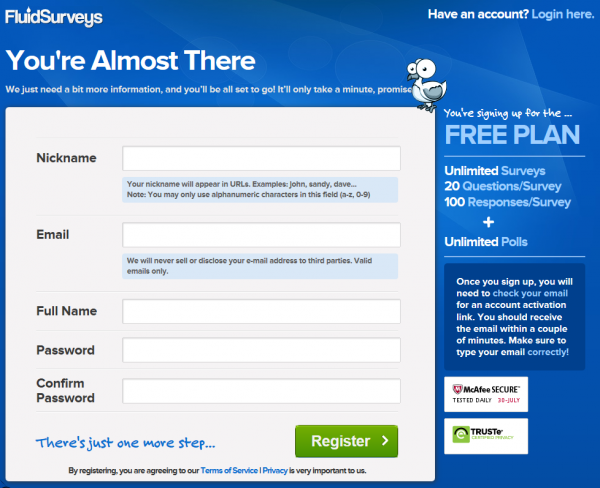 To sign up for FluidSurveys only takes a minute. You just need to enter a few details and you are good to go. A confirmation email follows shortly and you are required to click on a link in the email to activate your account. We will begin the work on our first survey immediately. To get started, you need to enter the survey name and the default language. 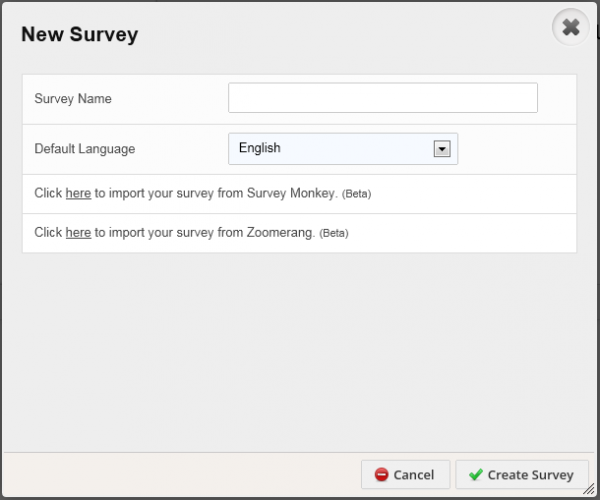 You also have the possibility to import a survey from SurveyMonkey or Zoomerang, but we will test that some other time. 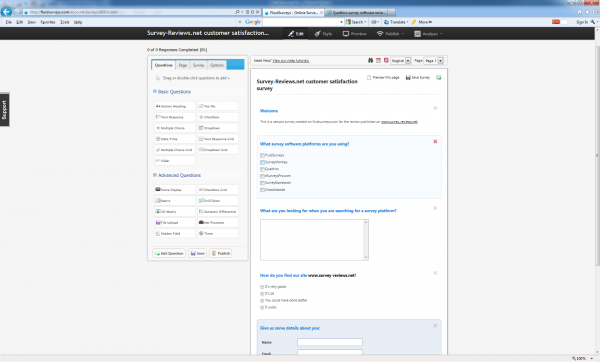 After entering the required information, you are redirected to the survey editor. I must say that it looks really nice and slick. A truly modern drag and drop survey editor. There are a number of settings here that we did not find on other survey sites and we liked them very much (and to name only 2 – the exclusive / select all / static choice or the append to previous question that is particularly interesting if you would like to add a comment field to the previous question). Very clean, nice looking survey theme. 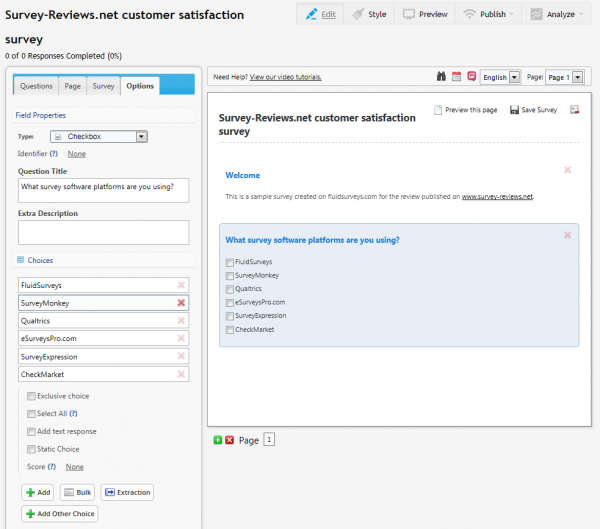 If you are not satisfied with it, you are free to choose from 13 predefined survey themes or customize your own by changing the colors, fonts, etc of all page elements. Because we are now ready, we will hit the “Publish” button to see our deployment options. Share on social networks (Facebook, Twitter, etc). Some of these options are available for free, some of them are only available for advanced paid subscriptions. 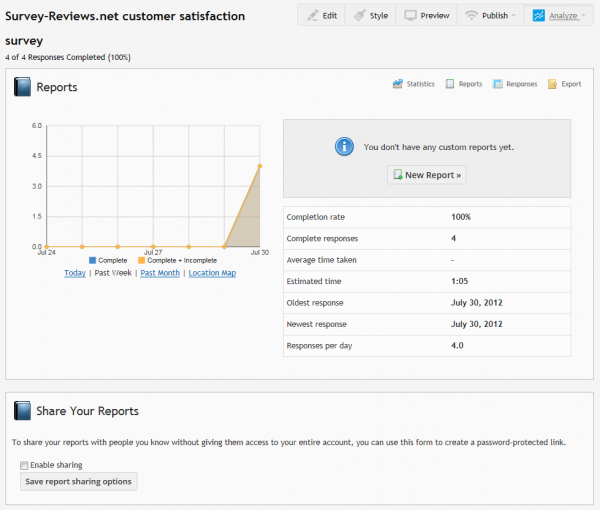 The first (statistics) displays quick stats like number of responses, completion rate, responses per day chart, etc. 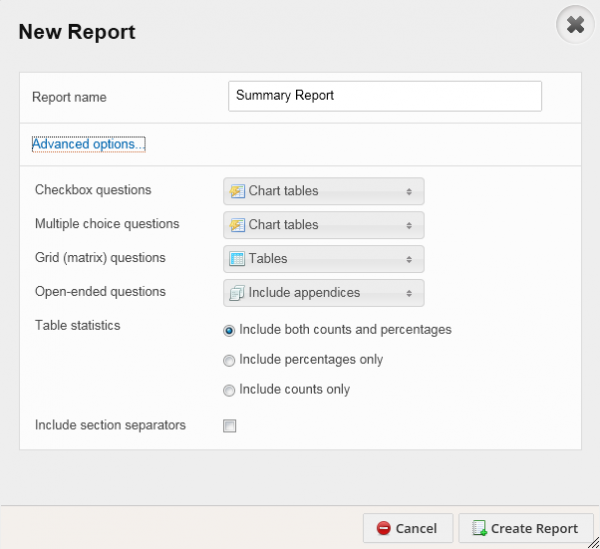 The reports section allows you to create custom reports. We will need to see a summary report for our survey, so we will create one. The report, we must say, looks stunning. Export the report to Word, Excel, Powerpoint or PDF (these are not available to the free account however). In the responses area of the reporting section you can see the list of individual responses, filter them, add / edit / delete / import responses. To tell you the truth, there are not too many things we did not like here. 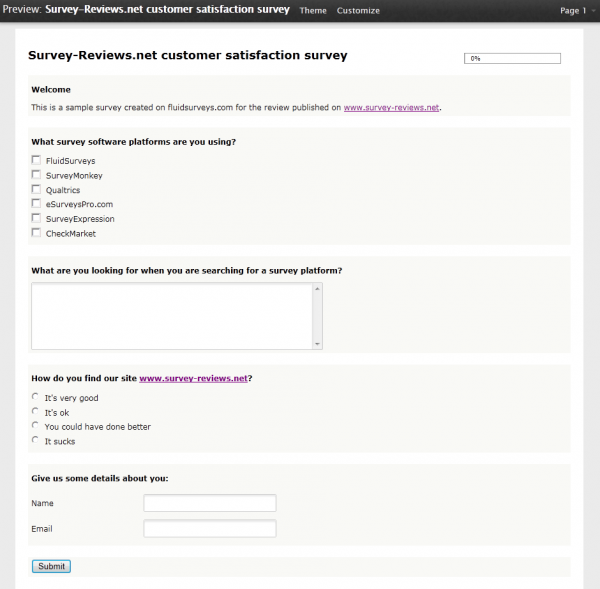 FluidSurveys is one of the best free online survey tools that we have reviewed so far. 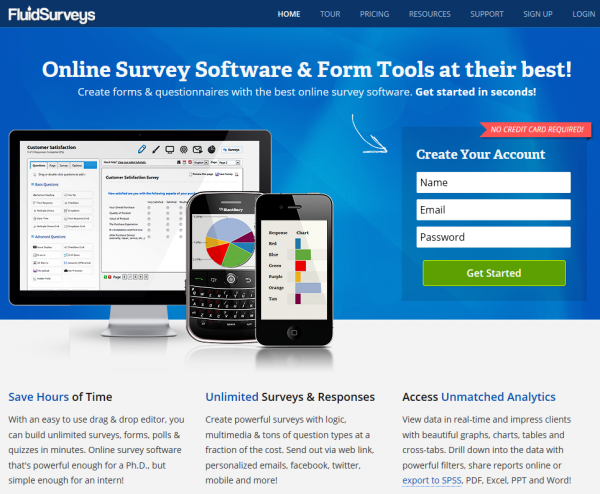 For more details about online survey tools and survey software reviews, visit www.survey-reviews.net. Great review and great product indeed.